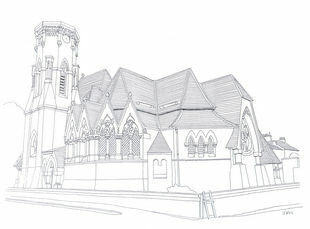 Designed in 1863 by Frederick T Pilkington in his typically eclectic interpretation of the Gothic style. Short columns support massive leafy capitals and tall pointed arches with rugged stones. The interior is crowned by an open timber roof with a complex structure. Variety of leaded and stained glass windows. Organ by C & F Hamilton 1901. Fully restored 1991. Short history available.